The pair has dropped down by more than 200 points since the middle of January, the trend has changed due to the closing of long positions at the peak and the growth in demand for the "cheap" dollar. Yesterday, after several unsuccessful attempts to go lower, the pair bounced off the first strong support level and began to grow again. Today, additional support for the pair was provided by strong data on the key indices of the Eurozone and the persistence of high economic growth rates at the end of last year. Today, the US will publish the Fed decision on rates, and at the end of the week there will be data on the labor market (Nonfarm Payrolls) and on production orders. This week, the Fed is unlikely to raise rates and tighten monetary policy after previous statements and weak macroeconomic statistics at the end of last year. Most likely, after the Fed meeting, the dollar will continue to fall. Technical indicators at the higher timeframes did not change their signal to buy: MACD still indicates the growth in the volume of long positions, and the Bollinger bands are directed upwards. Support levels: 1.2420, 1.2400, 1.2360, 1.2330, 1.2290, 1.2250, 1.2210, 1.2075, 1.2030. 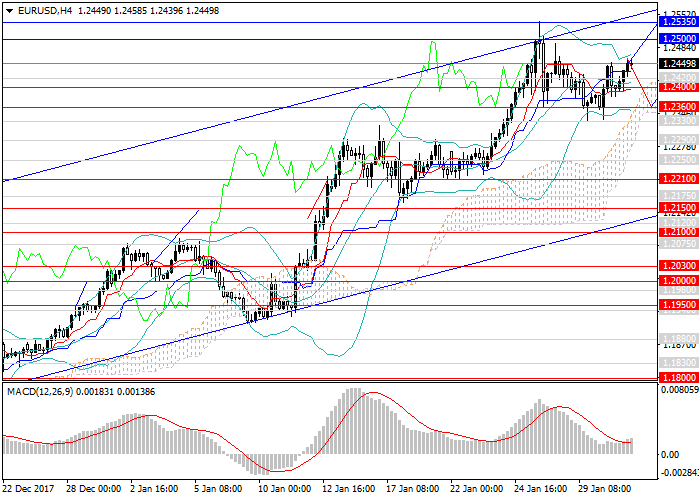 Resistance levels: 1.2500, 1.2535, 1.2585, 1.2630, 1.2650, 1.2700. Long positions can be opened at the current level and pending buy orders can be placed at the key support of 1.2360 with the target of 1.2585 and the stop loss at 1.2315.